I’m thrilled to have author K. A. Laity joining us today. 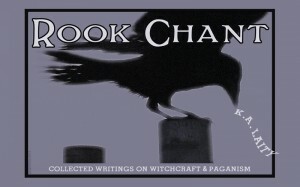 Comment below to be entered to win an ebook copy of her non-fiction collection Rook Chant: Collected Writings on Witchcraft & Paganism (suitable for most ages). 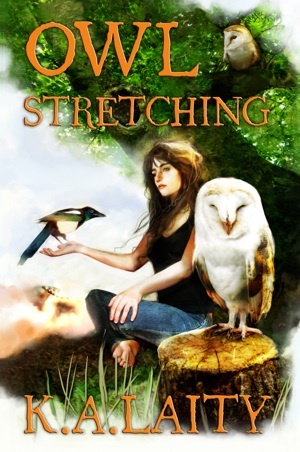 In my novel Owl Stretching, I describe the main character Ro as an ‘accidental’ shaman. What I mean by this is someone who has not been mentored in the art and remains completely ignorant of the practice—until she finds herself journeying in an alternate reality. Although Ro’s story has a lot more to do with her bad choices (not taking responsibility, in fact doing her best to avoid conscious rationality as much as possible), when she accidentally meets the creature who will become her guide and mentor—a magpie from hundreds of years before her time—curiosity gets the better of her and she begins to seek out questions without knowing where to look. She turns to her librarians. In the Google era, much has been said about the superfluity of libraries, but as Ro figured out, knowing what questions to ask was as important as finding answers. Often when we have experiences that are difficult to explain or describe to others—that sound wrong or crazy or impossible when we try to put them into words—it’s difficult to know where to turn to find answers. Ro is a liminal figure: someone who stands between things as shamen and shamankas often are. She has a fluid sexuality, she doesn’t identify for or against things that people feel she ought to do, but feels a dissatisfaction with her life. Ro worries that there is something significant missing from her life; never mind that her best friend has been in a coma for ten years—oh, and did I mention that there’s also an invasion of aliens that are anything but friendly. If you’re reading this site, you already have some idea of the journey ahead of you if you choose to follow a shamanic path. When I first received formal training in shamanic practice, I was amazed to find I had already learned many of the skills without a mentor to guide me (which meant I had some poor practices and little in the way of protection). I think creative writing in particular (though to some extent, all the arts) offers similar skills to shamanic journeying. Diving deep into the unconscious, finding threads to follow and returning with the story needed—whether you’re helping someone to heal or constructing a fictional world, the skill needed is the same. The more you’re conscious of it as a practice, as an art, the more you are likely to respect the work you do and value the gift you reveal. The intoxication of the journey should not overwhelm the power of the story you bring back. Stay connected, practice with discipline and build your strengths. No one else can tell the stories that lie within you. It’s your job to locate them and bring them to the light. K. A. Laity is the author of novels like White Rabbit, Owl Stretching, Pelzmantel and many more stories, plays and non-fiction works. 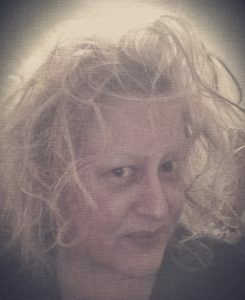 Over at Witches & Pagans, she’s the History Witch, currently translating the Viking wisdom poem Hávamál with commentary. Find her on her website or Amazon Author Page, Facebook, G+, Goodreads, History Witch at Witches & Pagans, Scribd, Soundcloud (audio), Twitter and Wattpad. Comment below to be entered to win an ebook copy of her non-fiction collection Rook Chant: Collected Writings on Witchcraft & Paganism(suitable for most ages). 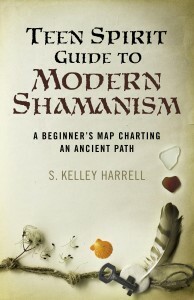 Available worldwide, Teen Spirit Guide to Modern Shamanism. Really interesting read! thanks for the blog post and for the introduction to someone who sounds really cool! Nice to ‘meet’ you, Amanda! I’ve been on this accidental path rather intensely for almost 2 years now. Although, in hindsight, I see that it began long before, just not as intense. It was nice to see you mention those experiences that are difficult to explain. These experiences, the stories that they reveal and the energy that shifts as a result, have saved my life and has started to rekindle my spirit. There is a yearning to share and a sadness that few will understand. I write a lot and this helps. Thank you for sharing! I’m glad you write a lot, Julie. I think it helps, too. Those who understand will always be few, but writing gets the thoughts down and it’s a huge relief. Thanks for hosting me, Kelley! And hello, Kevin. I think there are a lot of us who lack mentors for the magical arts — and for the arts in general. We have to go out and find them. At least with the internet it’s so much easier to find like minds. I’m so grateful for it. Thank you for hanging with me, today! I can identify with the main character of this new book, no mentor but accidental knowledge. Having spent years in traditional religion, but at the same time having dream journeys that would confuse or terrify many,I learned things that eventually pulled me from religion to spirituality. Ordainedd a metaphysical Minster in 2009,I thought my journey sure and south. Little did I realize the roller coaster through alternative ways of looking and being in the world I signed up for. So many of us went down that road. Glad to finally pass you along it, Kevin.